+ATK: An Attack Asset is an excellent choice for capitalizing on her already great Attack stat and is ideal for one-shot builds revolving around the use of effective damage weapons such as her native Poison Dagger or the Sky Maiougi. +SPD: Taking a Speed Asset bumps up Kagero’s middling base Speed stat of 32 to a more workable 35, and is ideal for offensive builds that are reliant upon her ability to consistently double. RES: Although raising it is not a priority, Kagero’s Resistance stat is serviceable and gives her the ability to tank a single hit from a mage should she need to; it also allows her to make decent use of Ploys. HP: It is recommended to avoid taking an HP Flaw as doing so detracts from her magical bulk, though it can be an acceptable alternative should a Defense Flaw be unavailable. -DEF: At a neutral physical bulk of 53, dropping Kagero’s Defense stat is ideal as it is too low to ever make a difference in her match-ups. This set aims to turn Kagero into an extremely potent force during the Player Phase, relying on her ability to double in order to consistently activate her Special. As such, a +SPD IV is ideal for this build, though an Attack Asset can be considered as well to strengthen her damage output outside of Special activations -- do keep in mind though that taking this IV will make her more reliant on team support to perform follow-up attacks. Low cooldown Specials like Glimmer and Moonbow are especially effective for this build, though the choice between the two is ultimately up to personal preference. Given her good damage output, Glimmer will generally provide Kagero with a solid boost to her damage output and fares considerably better than Moonbow against enemies whose bulk lies mainly in their HP. For more consistency against foes with a high Defense stat, however, Moonbow will be the preferable option. Moving on to weapon choice, Lethal Carrot makes for a fantastic weapon on Kagero, granting her a flat +10 damage boost whenever her Special activates; when paired with the Heavy Blade seal, she will be able to consistently unleash deadly Special activations upon her opponent in every round of combat even when under Desperation's HP threshold, provided that she performs a follow-up attack and that Heavy Blade activates. Barb Shuriken's consistent -1 Special cooldown allows it to function as a powerful candidate as well for those who wish to be less reliant on the Heavy Blade seal to activate her Special, or if wishing to make use of stronger Specials altogether such as Draconic Aura. Atk/Spd Solo is her A slot of choice, allowing her to maximize her offensive presence with its significant +6/+6 boost to her offenses. In addition, as this build primarily focuses on Kagero's capabilities in the Player Phase, she will typically be away from her allies regardless, allowing her to reliably activate the skill's effect. Swift Sparrow and Fury are good alternatives should Atk/Spd Solo be unavailable, with the latter in particular having the added benefit of improving her low overall bulk and gives her an easier time in using ploys. If making use of Ardent Sacrifice, Brazen Atk/Spd and Life and Death are available options to her as well as a single use of Ardent Sacrifice will immediately drop her into Brazen’s and Desperation’s HP threshold. For her C slot, Even Spd Wave is a powerful skill that grants her and any adjacent ally a substantial boost to their ability to perform follow-up attacks on even-numbered turns. Her decent base Resistance allows her to be a pretty good user of Def Ploy, especially if equipped with Fury and can be taken to sizably boost her damage output against any foe she manages to land its debuff on. However, it should be used with caution if Kagero is running Moonbow as the debuff does lower Moonbow’s effectiveness slightly. Otherwise, Kagero can run any C slot that compliments her team composition. A Player Phase oriented build that capitalizes on Kagero’s ability to one-shot opponents through the use of her native Poison Dagger, the Kitty Paddle, or any of the other effective-damage daggers such as the Sky and Cloud Maiougi. Such weapons are fantastic options and pair well with her already fantastic base Attack stat, granting her a 50% Attack increase against opponents infantry units, mages, armors, and dragonstone users respectively. To further boost her ability to one-shot such opponents, it is recommended to take an Attack Asset coupled with the Attack +3 seal. Glimmer is a fantastic choice for a Special and scales well with the effective damage boost from her chosen weapon, but does worse against opponents that Kagero doesn’t do effective damage to. For more consistency across a wider variety of opponents, Moonbow is also an option though ideally, Kagero will only be attacking opponents she can one-shot as she lacks the bulk to tank any kind of retaliation. Death Blow is her ideal A slot, supplementing her Attack stat even further, and offers her the highest chance of killing her opponent with a single strike. Her B slot with this build is extremely flexible, leaving it open to a variety of different options. Chill Def is a great option thanks to the fact that units have become increasingly bulkier and harder to one-shot with the introduction of weapon refines; however, it is not a guarantee that Chill Def will target a foe who she does effective damage against and can be inconsistent at times. Chill Def may also find its uses with the Kitty Paddle against bulky mages such as Winter Tharja but generally, it is unnecessary. Instead, she has the option of running Cancel Affinity in case she ever faces off against a TA Raven mage. Otherwise, she is free to run any B slot that could possibly compliment her allies, such as Wings of Mercy or a Chill skill. Like her B slot, her C slot is flexible as well and can be filled in with any skill that best suits her allies' needs. That being said, Odd Atk Wave is a formidable option that one can take to make her much more self-sufficient, augmenting her OHKO capabilities greatly on odd-numbered turns. Once considered the strongest dagger unit in the game, Kagero has definitely fallen quite a bit as the game progressed. Though she is still in possession of a decent offensive stat spread of 35/32, she has been thoroughly outclassed, lacking the offensive prowess or utility that other new dagger units possess. Her low overall damage soak does her no favors either and renders her unable to initiate against DC users she cannot kill in one round of combat for fear of being killed in retaliation. However, the recent addition of offensive daggers such as Lethal Carrot and Barb Shuriken has breathed new life into many dagger units with Kagero being no exception. With new toys at her disposal, Kagero finds herself able to become an incredibly powerful unit in the Player Phase, capable of shredding teams apart with the proper set-up and support. 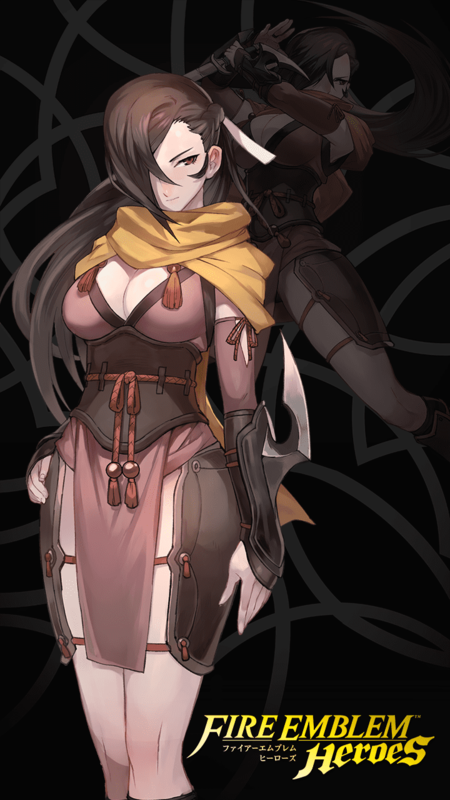 Even though she does have her well-defined weaknesses, keep her out of harm’s way and Kagero still proves to be a strong offensive presence in her own right. Boasting one of the highest Attack stats amongst all daggers, Kagero's good Attack stat ensures that she will consistently be able to deal good amounts of damage and decently chunk opposing foes. Additionally, this gives her some much-needed flexibility with her builds as she has the option of going all in for one-shot builds or investing in her Speed for more general use builds. Kagero is currently available in the 3-4* pool, making the task of acquiring merges and the perfect IVs for her relatively easier in comparison to some of her competition. With a horrid physical bulk of 53, Kagero has an incredibly difficult time dealing with Distant Counter users that she cannot OHKO or ORKO. Even her magical bulk is rather lacking, as her incredibly low HP takes away from her ability to tank more than a single magical hit. Having started out as the strongest dagger unit in the game, Kagero has slowly fallen out of favor for dagger units with a stronger offensive presence like Spring Kagero or who provide more utility like Sothe and Performing Olivia. Since Kagero should always be looking to capitalize her strength in the Player Phase, allies like refreshers and buffers who can enhance her overall performance are greatly appreciated. To take care of high Defense units that she can’t ORKO herself, physically tanky allies who can make quick work of such foes are also welcome. Refreshers: Though many units appreciate refresher support, this is especially the case for Kagero as such support allows her to either kill multiple foes in one sitting or to safely get out of enemy range after having picked off an opponent. As such, refresher allies like Bridal Ninian, Lene, and Performing Azura are great choices for allies. Buffers: Units such as Sanaki, Ephraim, and Brave Lucina who can offer buffs to her offensive stats improve Kagero’s Player Phase tremendously; buffs to her Attack may prove to be particularly useful if running the Heavy Blade seal. Physical Tanks: Even with her decent offenses, Kagero may sometimes find herself unable to ORKO a DC tank, leaving herself liable to be killed on the counter; in such instances, physical tanks like Lukas, Shiro, and Winter Chrom come in handy, ridding Kagero of the worry of having to initiate on such foes. As a unit with low damage soak, Kagero is an easy target to pick off so long as one initiates against her. Player Phase oriented archers and strong melee units who can apply pressure on her are particularly effective counters. Mages who run the tried-and-true Triangle Adept/Raven tome build are also great counters, shutting down her high Attack through Weapon Triangle Advantage. Offensive Archers: Particularly those who wield Player Phase weapons like Brave Bow and Firesweep Bow, offensive archers such as Brave Lyn, Hinoka (WF), and Halloween Jakob exploit Kagero’s weak Enemy Phase to easily defeat her. Strong Melee: Kagero’s paper-thin Defense stat allows strong melee units such as Tana, Elincia, and Raven to kill her in just a single round of combat. Raven Tomes: Mages such as Lyon, Sophia, and Spring Camilla who commonly make use of a Triangle Adept/Raven build can easily dispose of colorless units, with Kagero being no exception even with her decent Resistance. Just as a note my Kagero is a Level 40+5. First off her weapon is what makes her awesome, because it does bonus damage to infantry units which at least at this point in the game is at least 50% of units in the game are that. So the chances of running into one are really good. Just keep in mind that if you run into Robin (M) or Cecilia and armor units stay away! Those are three of Kagero&#039;s biggest threats but outside of that she can also hold her own against cavalry and flier units as well. As for her A Passive I chose to run Life and Death 3, a very expensive ability and LoD2 could work just as fine. I have her set up as a glass cannon of sorts, try and do as much damage in one go, you could go Death Blow 3 but i prefer to have the extra 5 SPD and having the extra DEF and RES isn&#039;t going to help her in the long run. for other options Fury 3 can work especially if you are running Desperation 3. The only one skill that should be on her is Desperation 3, the fact that she is a glass cannon unit you need to make sure that she can kill a unit every time she attacks. For her C Slot it can vary, Threaten Spd, and Def are the two best IMO. However Hone abilities like ATK, SPD or DEF can also work to support other allies. And if you want to be a little different Savage Blow could be fun as well. As for her support skill I recommend Ardent Sacrifice if she has a bane or neutral HP stat but if she has a boon in HP maybe Reciprocal Aid, this is to ensure she gets to the Desperation threshold. The final skill I have yet to mention is the Special ability which can be a variety of but the best one would be Moonbow due to its low charge time but if you have a +SPD and LoD3 with a Quickened pulse seal you could run luna instead. Since a lot of popular mages are infantry, this build allows baiting enemy mage to set up Vantage and Glimmer (if neither double) for the next turn. +Atk preferred for the most effective damage, and Def Smoke would make securing kills even more consistent. Kagero is in the awkward position where every stat needs help, but at least Fury and Brazen Atk/Res seal are great to start with. If refine with same effectiveness happened, HP boost would justify a bane to similarly counter kill infantry bows. Until then a Def bane is preferred to specialize against the more common mages. For AA. Chunk dragons and maybe kill squishy infantry mages. Life and Death over Deathblow if you can't double some dragons with near 40 SPD like +10 +SPD Nowi with SPD refine. The new Summer units brought amazing weapons with them as they all contain desperation embedded in the weapon. Since Kagero can take advantage of this by inheriting the weapon her B-Skill is now open for another skill. Brazen Atk/Spd will immensely increase her offensive abilities so that she will perform better when she initiates combat. Chill Spd will, obviously, decrease the foes Spd so that she can double the foe and defeat them. Then the Atk Smoke, this will work well with Dagger weapons and they decrease the foes Def and Res by 7. Add that with Chill Spd and Atk Smoke: that's -7 Atk/Spd/Def/Res. Standard anti-infantry Kagero. Her spd- means that she won't be doubling much of anything, but she can still kill a large amount of units, mages and high-risk firesweeps, that would otherwise be annoying. Death Blow pairs well with the bonus damage from the poison dagger. I picked moonbow over glimmer to help fight tankier units that might not be infantry. Her B-slot is constantly changing between vantage, windsweep (with phantom spd), and wings of mercy. Poison DaggerEffective against infantry units. Infantry foes suffer Def/Res-4 after combat through their next actions. Poison Dagger+Effective against infantry units. Infantry foes suffer Def/Res-6 after combat through their next actions. RetributionBoosts damage dealt to foe by 30% of damage dealt to unit. ReprisalBoosts damage dealt to foe by 30% of damage dealt to unit. Warding Blow 1Grants Res+2 during combat if unit initiates the attack. Warding Blow 2Grants Res+4 during combat if unit initiates the attack. Warding Blow 3Grants Res+6 during combat if unit initiates the attack. Daggerbreaker 1If unit's HP ≥ 90% in combat against a dagger user, unit makes a follow-up attack and foe cannot. Daggerbreaker 2If unit's HP ≥ 70% in combat against a dagger user, unit makes a follow-up attack and foe cannot. Daggerbreaker 3If unit's HP ≥ 50% in combat against a colorless dagger user, unit makes a follow-up attack and foe cannot.